Daily Illuminator: Good Things Come in Threes. Twice. December 21, 2009: Good Things Come in Threes. Twice. Last week, we released a whopping three PDFs. That was so awesome that we decided to say, "What the heck, let's do it again!" And so we have. So what's on the menu this week? Bam! 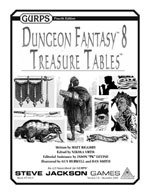 GURPS Dungeon Fantasy 8: Treasure Tables. Herein shall you find all manner of items you might stumble over as you perform your violent evictions of the denizens of the underworld. If you haven't bought the GM in your life a gift yet, then giving this would create a sort of ideal symmetry that simply cannot be ignored. Boom! Pyramid #3/14: Martial Arts. You may have seen this one coming, what with Pyramid being a monthly release and all. What you don't know is that this issue is fast as lightning. In fact, it's a little bit frightening. But it's cool, our contributors write with expert timing. Bang! In Nomine: Game Master's Guide. Now there's an old friend we haven't seen in a while. Would that mean that now is an excellent time to drag out the In Nomine books and shows those philistines what they've been missing? Only one way to find out. Today is the first day of our holiday vacation. As a result, no one is in the office. Feel free to leave a voice mail or shoot us an email, but we won't be reading or responding (or processing Warehouse 23 orders!) until Monday January 4, 2010. Happy holidays!